One of New Zealand's greatest potters, Barry Brickell, paid a visit to Dunedin this week, so I went along to check out his live throwing exhibition at the Art Gallery, where he threw one of his famous 'fatso' jugs. The exhibition of his work: 'His Own Steam' is an amazing collection of 100 pieces showcasing a lifetime of exploration and experimentation, and I would totally recommend going to see it. Barry Brickell specialises in wood firing and the use of natural glazes, two things that are really important to me in my own work, and not only that - he is totally self-sufficient - he digs his own clay and runs his own private railway at his place in the Coromandel. Here is a link to a great video from 1970, that captures the essence of that magical time in New Zealand pottery. In honour of his visit there was a public wood firing over a couple of days at the Otago Polytechnic Art School. I managed to put some pieces in - a vase and three of my bellarmine jugs that I have been waiting to salt fire. Bellarmines are decorated stoneware drinking vessels from the 16th Century in Germany that have a long and curious history - the fierce bearded face on the side may represent a mythical 'wild man' or an unpopular politician at the time - but I have to say his expression only improves with a foam of beer flowing out of the top of his head and over his rounded belly. Bellarmines were also widely used as 'witch bottles' in the Middle Ages - they have been found buried under houses containing various magical bits and pieces (black or white). Here are some of mine. They are a good tankard size, holding about 500 mls, just slightly smaller than traditional bellarmines. Several Dunedin potters and ceramic arts students put pieces into the firing, which started on Thursday afternoon and carried on for most of Friday, with wood being cut and fed in until it reached Cone 12 around 1 am. Then it was turned off and cooled down until Sunday midday, when I went along to see the results. And here's the sight that greeted us when we opened the lid. You never know how it's going to work out, but this was amazing - the transformation from everything being pink to being beautifully ash glazed. It was quite a buzz. The shelf on the right contains materials collected from potters past, some I won't bother testing because there's not enough to be worthwhile, but I do like the eclectic collection of glass jars and materials. Some of the materials from the shelf that I will be testing including a bag of 'Sunset Orange'. Looks like something from the 1950's. The large bag of Smith & Smith glaze turned out to be a nice old school oatmeal glaze. Side-handled teapot, teabowl and small breakfast bowl, along with some porcelain beakers from a recent firing. Glazed in celadon. Shrinkage and warpage bars after firing 1300 degrees C. The shrinkage bars were all under 15% shrinkage, made from throwing-consistency clay. The warpage bars all warped except the pipe clay. It was surprising that the commercial stoneware clays warped about the same amount as my own homemade stoneware and porcelain clay bodies. These are some recently acquired materials that had been left in unlabelled bags. To get a better idea of what they all were, I had to fire a small amount of each one to see how each one reacted at 1300 degrees C. They all looked like white/grey powder but fell into four main categories: Nepheline Syenite, Silica, Kaolin and Ball Clay. The main materials for clay bodies and glazes eg: silica, clays, fluxes, calcium carbonates, feldpars, fritts, etc. These are the main colourants after firing to 1300 degrees. I added a strip of clear glaze down the left side of each example. Some of the colours burnt out at this high temperature but others didn't look too bad. Unnamed materials test results. 1. is unknown pink stuff from Glenfalloch Pottery, fired to an opaque white glaze, most closely resembling the Zircon Fritt, which you can see in the picture below. The Zircon Fritt was resourced from a retired potter. I haven't had any experience with these materials, as this is the first time they've been tested. 2 looks like Nepheline Syenite and 3 Silica. 7 is Kaolin. Recently I was lucky to get my hands on some very old clay and pottery materials, but unfortunately nobody remembers exactly what they are. 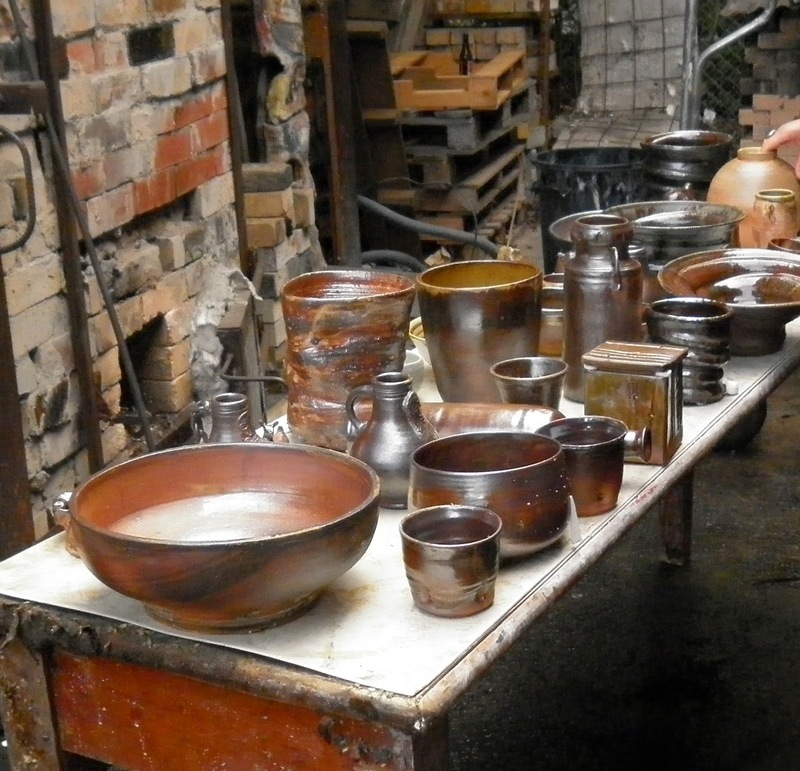 They were stored for thirty years underneath a pottery which is now closed. Rumour has it that they originally came from the clay factory at Benhar, and could be materials such as kaolin, ball clay, and feldspar...and then there is some mysterious pink stuff. This could be a fritt, a glaze...or even a fertilizer, who knows! To anyone who doesn't know it just looks like dirt. Excavating them was a mission, as a few bags had split open over the years spreading clay dust everywhere, and I had to cart them along a muddy goat track above a steep drop to a creek. Some of those bags weren't exactly light either. Various shades of clay ranging from yellow-white, white, grey-white, to grey. Some could be feldspar, silica or kaolin clay? Some fire bricks intertwined with roots of the 'paper tree' (fuschia?) Reminiscent of a scene from Tomb Raider. Breaking up bags of rock-hard pipe clay (?) under flourescent light, at night. This clay has a beautiful waxy feel - it could even be a fire clay. To test this, I'll fire it in a kiln to 1300 degrees Celsius to see if it vitrifies. If not, I might add some feldspar and try to construct a workable clay body. Midwinter is a good time to clean up the tools that I've made and collected over the years. Seems like a lot but I only ever use half a dozen at a time. Buckets of pipe clay (originally intended to make sewage pipes?) and our new kitten. I found him in the middle of the road a couple of months ago on the way out of the local 'Refuse Recycling Centre' and took him home. He's quite a character and full of curiosity, he's always on the go. Making my own porcelain clay body - and I'll do these tests with the other clays as well. They are a warpage bar, a shrinkage bar, a small thrown beaker and a test tile to test glaze fit and vitrification. From this I should be able to formulate a throwable clay body, in porcelain and South Stone (stoneware). I am also planning on testing everything in my glaze lab so I have something to compare these results to. A couple of years ago I got some glaze materials that also need tested so I might as well do that while I'm at it. But that will have to wait for the next blog post. Lovely day, about time I updated my blog, gonna keep it short and sweet. loose vase shapes to be raku fired. Should be nice if they can handle the thermal shock. Over Easter I fired fibre and brick kilns, with varying degrees of success. The gas kiln is always easy, being gas, but brick and fuel kilns are a different matter. After about two years of experimenting with different fuels, I have decided to go back to diesel for the following reasons...sure, sump oil from a local garage is a free fuel source, its viscosity is also good, being mixed oils and transmission fluids. All of these burn extremely well and it gives a certain sheen to a glaze like only oil can, but it would have to be one of the most filthiest substances known to man. It's also quite possibly carcinogenic and turns the potter pitch black. After working with how clean gas is, I would prefer it to be like that for the brick kiln. Which brings me to... vegetable oil mixes; the best one being a 50-50 mix of diesel plus canola oil from the local fish and chip shop. This also burns good and gives nice results, but it has to be mixed and for best results put through a filter so as not to clog up (even slightly) the taps and burners. This can be time consuming, unless one enjoys this sort of thing. The final straw for me was when it came to what was taking place in the fuel tank. I thought viscosity was the problem, then I saw the crap that came out of the tank! I had put clean canola oil in and it grew some sort of green algae slimy shite and a lot of it - that would slow down the flow somewhat. The sump oil had also left behind metallic dregs like small flakes and even little twists of metal, that looked like little snails, all packing down into a solid mass at the bottom of the tank. Sometimes being frugal doesn't always pay off, but you have to try these things to see what does. Preheating fire box .In this firing, I came in with desiel at about 300 degrees centergrade. Once the diesel took hold I could control the rate of firing, just like the gas kiln, going from 300 C to 1300 C in around 8 hours. Lunchtime in the best of company. Watching cone 8 go over, about to throw the salt in for one hour, just after sunset. As for atmosphere, it was going to be oxidised but with opening and closing the dampner and winding the fuel up till it looked like a dragon breathing through it (reduced), or knocking the fuel back to slow it down a bit, creating a crystal-clear (oxidised) atmosphere inside, who knows what the outcome will be? Interesting results and heaps of beautiful glaze tests to analyze. Some of the better pots from the kiln, alongside cones 8, 9 & 10. Diesel simplified things so much, no clogging of taps and burners, no oil slick all over my face, arms and legs, and the results were awesome. It's as close to using gas as I can get without using gas. It's worth the extra outlay to be problem-free. Hmmmm... blue cheese and chicken, mushroom pizza and ham cranberry [plum,apricot] cream cheese garlic,oregano etc pizza washed down with a good larger or two. our sleepy hollow looking east, workshop center left. A large goat lives on the bluff up behind the kilns, he seems to have a lot of leisure time on his hooves, where he sits for hours cross legged. This morning I have caught his attention. It's been a busy year so far. I tried but failed at using canola oil as a fuel for the brick salt-glazing kiln - viscosity issues - so not enough flow, but since it is a medium-sized kiln I had a go anyway. It basically blew itself out, but no great loss that some work was damaged, as I'm still interested in the test tiles that are still in there. I have already mixed up a test fuel to fire up this weekend if the weather holds out. Spyhole on the gas kiln- 800 deg. celsius and cooling. Bottom shelf of the 'crypt' (salt glaze kiln) plus test tiles and clay sheath [top left] to protect the probe from salt. If only it was like this all the time! Bursting, stony texture from local clay straight out of the ground. When the sun hits these pots, they heat up like they're just fresh from the kiln - the burnt caramel look is as pleasant on the eye as any glaze. Like a painter who does portraits of people, I like to make portraits of great pots in three dimensions. I am a potter living near Brighton, just south of Dunedin, New Zealand, with my partner Katherine and our two cats. We are situated near the beach, in an area of stunning natural beauty. I work with raku, stoneware and salt glazes.